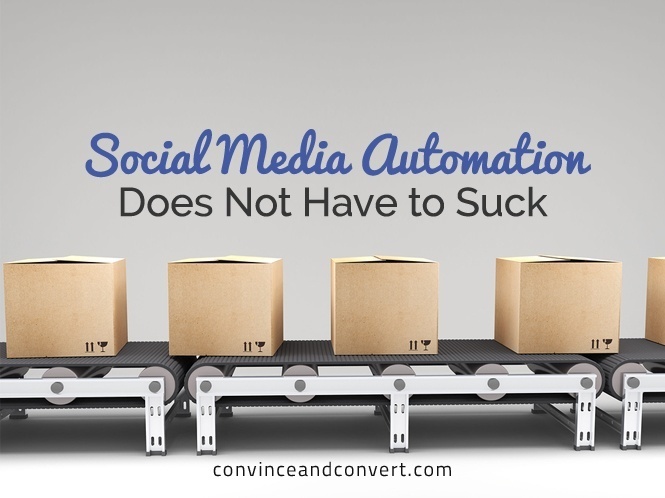 In my ongoing quest to test and learn what works (and what can work) in social media and content marketing, I entirely changed our email program here at Convince & Convert. As you may know, we used to have a 5x/week email called The One Thing, that provided a collection of links to timely and topical digital marketing links. We blew it up and launched Definitive, a 4x/week email that provides the best possible links about one specific digital marketing topic each day. We embraced quality and specificity instead of timeliness and variety. So far, it’s working. Subscriptions are way up. Open rate is way up. Click-through rate is way up. But with the Invitation Avalanche that we’re all faced with every day, it was clear to me and the Convince & Convert team that some of our most ardent fans weren’t aware of this switch. Simultaneously, we (finally) launched a Twitter handle for Convince & Convert (@convince) whereas previously we only used my personal account, @jaybaer. To address this, we launched a program with Insightpool, one of our terrific sponsors. Insightpool helps you find target audiences on Twitter, and then assists you in approaching those audiences at scale, in an efficient, semi-automated way. 1. We uploaded our One Thing subscriber list to the Insightpool platform, and matched ~ 6,000 of them to known Twitter handles, a great match rate. This means that our email subscribers are active on Twitter for the most part (no surprise given our audience), and that many subscribers are using the same email address for email signup and Twitter signup. A good indicator of quality. 2. Working with Insightpool, we created multiple messages to approach these One Thing subscribers to let them know that we had changed over to Definitive. We created other messages to target non-subscribers who are senior level digital marketers (based on InsightPool data) and encouraged them to follow @convince and subscribe to Definitive. 3. Insightpool automatically sends the tweets to the identified audiences, a few at a time. 4. Lisa Loeffler, our community manager, monitored the interactions and jumped in to answer questions and provide personal replies. Since this was our first program with Insightpool, I wasn’t entirely certain what to expect, but the results were strong. 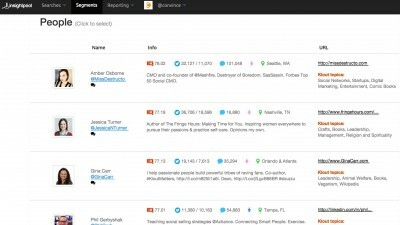 We generated 219 new followers to @convince directly from this initiative. We generated 1,333 new followers overall since we started with Insightpool. Those new followers have an average of 7,352 followers of their own, so a disproportionately well-connected group. Even more importantly, we generated 6,320 clicks from the campaign. Most of those were to the Definitive email landing page. Nice! We could only pinpoint 14 new Definitive subscribers to this effort directly, which is disappointing. However, given the 6,320 clicks, it seems almost impossible that our conversion rate would be so low. I suspect we may have had some tracking issues, and we’ll want to test that more aggressively on our next campaign. You don’t want to be tweeting the exact same thing, over and over. Think of at least 10 variations. If you need to get a lot of traction in 2 days, Insightpool isn’t going to work for you. It’s not really viable to do this all at once, because you’ll be tweeting similar messages in large volume, and people will notice. This campaign was a little tricky for us, because we were promoting @convince (and contacting people from @convince) rather than from @jaybaer. That probably diminished results a little bit, but I’m not entirely comfortable automating like this (even in a good way) from my personal account. The best part of this program is the ability to actually engage human-to-human with people who were tweeted by Insightpool, and response. You have to be able to jump in within an hour or two to capitalize on those opportunities for interaction. So really, this is “assisted automation” because you need a real person to be a part of it. After a few dozen tweets, it’s relatively easy to determine what’s working and what’s not resonating as well with the target audience. Insightpool makes this kind of on-the-fly creative change simple, as their account management team is fantastic, and easy-to-work with. I certainly understand the arguments against any automation of all kinds. It makes it more about the media, and less about the social. But realistically, from a business standpoint, I think that ship has sailed for the most part. As a media company, social media IS a business for me and my team, and I don’t believe apologies need to be made for that. You may disagree, and I 100% respect that. I also believe we have a responsibility to test opportunities that may work for our corporate clients, and to test everything from our sponsors. However, if your company needs to promote something (maybe a white paper, ebook, webinar, infographic, video series?) what Insightpool offers is a very intriguing combination of automation with a layer of humanity and personalization.